Thanks to the persistence of social innovators across the country, every day we see strategies that are working and delivering results in a rapidly changing world. This ongoing blog series will highlight the voices of our Coalition of 70+ social innovators and their innovative solutions to our country’s most pressing social problems, as well as examples of how this powerful work can be transformed into national change. Today we will hear from Sangeeta Tyagi, President of YouthBuild USA, one of our Coalition organizations, about Global YouthBuild Day, and the power of reopening pathways and engaging young people in creating solutions. The following post was written by Sangeeta Tyagi, President, YouthBuild USA. As we celebrate Global YouthBuild day on this same historic date this year, issues of social justice, equity, and opportunity remain front and center around the globe. These and other issues are very present for the 18 to 24 year olds in low-income communities that YouthBuild serves, and we believe that the best solutions will come from directly engaging young people. What their communities need, where the solutions lie, how their families meet and take on challenges are all questions that the world’s young people are equipped to answer if we were only to engage them as contributors to, and not as passive recipients of, societal solutions. YouthBuild young leaders are ready to have these conversations, offer solutions, engage their peers, and share a different vision of the society in which they live and work. In the U.S., this Presidential election year is bringing to collective attention a number of issues that YouthBuild students face daily: race, violence, lack of social mobility, excessive incarceration, and equitable access to opportunity overall. If any of these clear and present challenges are to be addressed, we will first have to change the public narrative so that Opportunity Youth – people ages 18-24 who are out of school and out of work yet embody great opportunity for society—come to be seen as “part of” and “party to” the vision for an improved, inclusive society rather than a Presidential campaign talking point. In order for this to happen, we have to actively create environments for under- and unemployed youth to earn their high school credentials, develop tangible skills that prepare them for the workforce, learn to see themselves as worthy of, and prepared for, postsecondary education, become ethical leaders and give back to the communities that need their leadership. YouthBuild provides such an environment to 15,000 young people around the world that come to us for a second chance at the ladder that can lift them out of poverty. 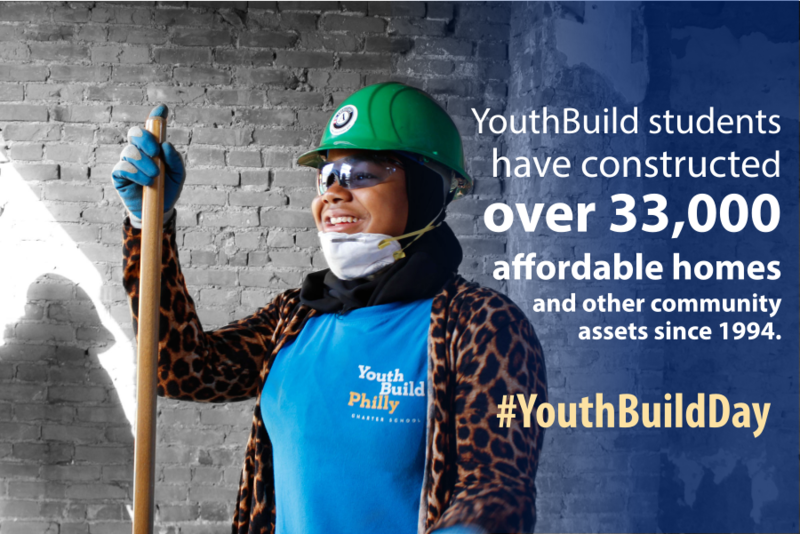 The 360+ YouthBuild programs across the globe offer a re-do at the pathway that might have seemed blocked to them at first but can be re-opened if society believes that all young people are worthy of investments of resources and opportunities. At YouthBuild, we see every day the transformation that the young people undergo as they become part of a community of adults and peers that believes in them, holds them accountable, shows them love, and cheers them on to success. YouthBuild St. Louis graduate Deginald Nevils illustrates the power of the program. Deginald got his high school degree, learned construction skills and earned national certifications during his time at YouthBuild St. Louis. He was also able to save $800 from the stipend he earned from working with YouthBuild, which was matched with $4,000 from the program and from YouthBuild USA. He used the money to buy, renovate, and sell a tiny, broken down home. With the profit he earned, he opened Nephew's, a soul food inspired, family-friendly restaurant, known for its catfish dinner and affordable prices. Deginald uses Nephew's as a way to give back to the community and he hosts regular events for local youth at the restaurant. Today, there are four Nephew’s locations in the St. Louis area, and Deginald has renovated space for a learning center - a place where he invites local students ages 8 to 16 to do their homework. For every 10 successful graduates, there are just as many young people who are turned away from YouthBuild programs for lack of resources—those we are not able to serve because the demand far outstrips the capacity of our programs to meet even half the need in their communities. And we watch as those same resources are spent in ever-larger multiples in incarcerating young people, in lost taxes and lost productivity, and in diminishing hope. We want to offer up our network of young people to candidates and elected officials in order call attention to common issues and offer solutions from the affected population. YouthBuild is working hard to engage the Presidential campaigns in understanding the needs of low-income youth and their communities by connecting them for face-to-face meetings and other outreach, and to date, we have successfully engaged the Clinton and Kasich campaigns. We are sharing proof points and data that will help convince legislators at the federal, state and local levels that these young people are worthy of increased investments. We showcase our graduates’ potential and abilities so that the business community will see the value of engaging and retaining Opportunity Youth in meaningful employment. Our goal is to tell the stories that will change the hearts and minds of all stakeholders to make the success of Opportunity Youth everybody’s goal. We are partnering with other like-minded organizations to build this ecosystem of success for all Opportunity Youth. Coalitions like America Forward are helping to magnify the message, leverage their reach to engage lawmakers and campaigns, impact policy, and serve as connectors so that multiple youth-serving organizations are preaching the same message: these young people are worth it. We believe that the problem of youth disengagement and unemployment is solvable. We know what it takes to re-engage young people towards optimistic, hopeful and productive futures. We are all too aware of the costs of not taking action – the implications of disenchantment and disconnection are all around us globally. What we need is the public and political will to make a decisive change. We need the farsighted leadership that looks beyond the next election or next budget cycle and to the long moral arc of a society where all young people are fulfilling their highest potential inside a society with opportunity and access for all. Read more about how social innovators in the America Forward Coalition, like YouthBuild, are solving America’s biggest problems in communities across the country every day in Moving America Forward: Innovators Lead the Way to Unlocking America’s Potential, and join the conversation. 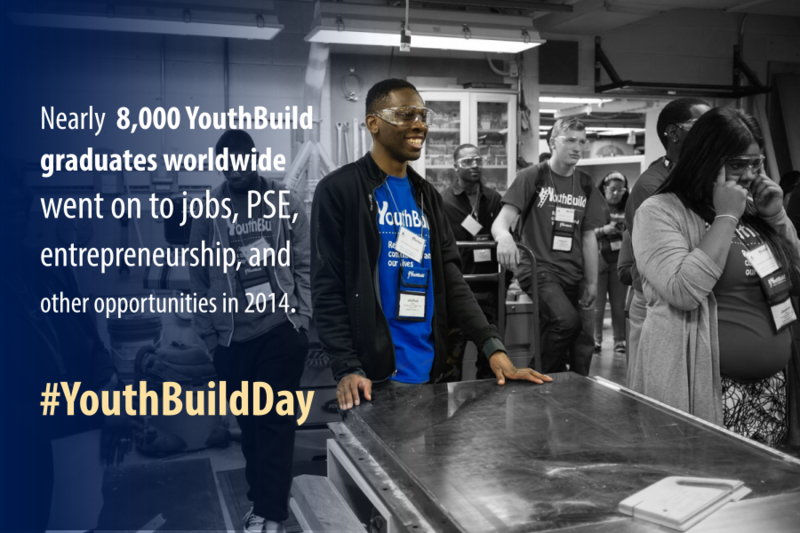 Follow @YouthBuildUSA and @America_Forward, and tell us how you’re re-engaging young people to create effective solutions using #YouthBuildDay and #AFPresidential16.